Educating homeowners, finding innovative solutions, overcoming adversity, contributing to the local community and community management excellence — that’s what CCMC is all about! Just ask the CCMC team at Providence. They represent these values in everything they do. That’s why their community was (once again!) 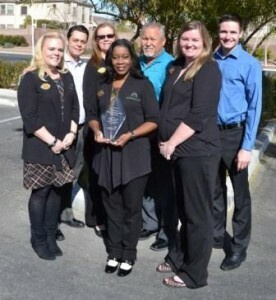 named “Southern Nevada Outstanding Master Association of the Year” by the Community Associations Institute (CAI) Nevada Board of Directors at their annual CAI Nevada Chapter Gala Awards, held Saturday, February 8, 2014. This is the second time Providence has taken home this award. “On behalf of the entire CCMC team at Providence, we are honored to, once again, be named Southern Nevada Outstanding Master Association of the Year,” explains CCMC community manager for Providence, Brandon Exline. “The continued support of CCMC, the Providence Board and our residents has unquestionably contributed to this recognition.” Brandon, we love your collaborative style. It’s SO CCMC!